Fun! That is the way I always describe Lightning Class regattas. 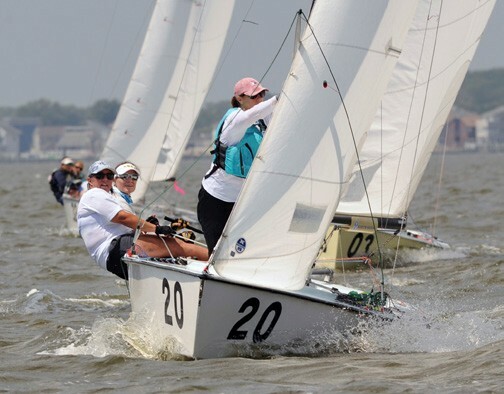 The North American Women’s, Juniors’ and Masters’ Championships, hosted by Metedeconk River Yacht Club and Lightning Fleet 34 in Brick, NJ August 2 – 4, 2017 was an exception in that it was super fun! Fantastic sailing was combined with a three-day family reunion, complete with a Mexican dinner, a pizza party, and a final great steak dinner conducted during a full on, four-lane corn hole tournament on the club’s beautiful front lawn. The only drawback was that, as is typical at Lightning events, it’s hard to get the boat rigged on day one because there is so much hugging, high-fiving and general banter that it’s hard to concentrate! Each day after racing, poolside debriefs from the leaders were held accompanied by keg beer, ice tea, lemonade and snacks. Forty-three boats had competitors ranging in age from 11-year old Sabrina Starck, crewing for her mom Jody in the Women’s division, to a large handful of more “experienced” sailors, north of 70, racing in the Masters. The Junior division age requirement was that participants could not turn 21 in this calendar year. The hosts at Metedeconk River YC did a superlative job. Their huge gang of volunteers and support boats took full advantage of the 10-15 knot southerlies that showed up unfailingly on beautiful Barnegat Bay. Six races for the Masters and seven each for the Women and Juniors yielded eight different race winners. Marvin Beckman, from Texas, sailing with Monica Morgan from Vermont and current World Champion Jimmy Barnash of Rochester, NY, put on a speed show, winning four of the six races to take the Master’s title. Placing second, from Cedar Point Yacht Club in Westport, CT, was Ched Proctor, with crew Kelly Chang, also from Cedar Point, and Ben Cesare from Norwalk, CT. Third went to Canadian Larry MacDonald, sailing with daughter Julianne and Ian Jones, all hailing from that Mecca of Lightning sailing, the “BCC,” otherwise known as the Buffalo Canoe Club. Taking the Women’s Championship was Laura Jeffers from Tarpon Springs, FL, with only nine points separating first from fourth place. Jeffers teamed up aboard I’d Rather Be Lucky with local Johanna Schon, wife of MRYC Commodore and Regatta Co-Chair Russ Schon (Johanna was the real, “on the ground” chair of this event, doing everything from tapping the keg to selling t-shirts when not racing!) and Niantic, CT’s own Theresa Colantuono for an impressive win over a very talented fleet. Second went to Debbie Probst, Monica Jones and Maggie Daley from the BCC, and third to Jody Starck and daughter Sabrina with Tess Weber, also from the BCC. The Junior Championship top five were only separated by eight points. Tanner Probst, sister Jenna Probst and Maya Weber from the BCC (seeing a pattern here?) 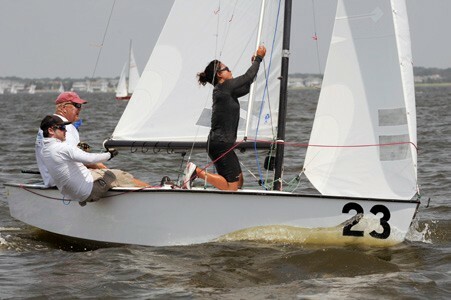 edged out Jeff Hayden and Hannah Sellers from the Florida State University Sailing Team and Brian Hayes, Jr., from Housatonic Boat Club in Stratford, CT by two points. In third were Robert Robinson, Becca Jordan and Gunner Grenauer, also from BCC. Probst made history by being the first person to win the Junior title three times, in 2014, ‘15 and ‘17. It is hard to overstate the vibe one gets when competing in the Lightning Class. There is never a doubt that the competition is fierce and truly world class. By the same token, the family atmosphere is real. Teams actually do bring their kids to events and yes, they do share babysitters, and yes, everyone is put up by local housing and yes, there is always a ton of fun after racing with tips or boat maintenance help shared freely. Kudos again to co-Chairs Jody Lutz, Russ Schon, all of the MRYC team and the Class for another great event. 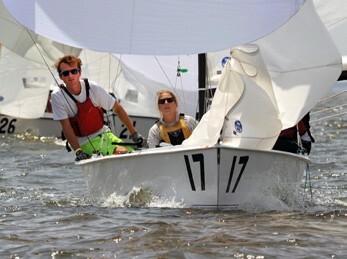 Next on the big event list for the Lightnings are the North American Championships this month in Wrightsville Beach, NC. Originally, the event was limited to 70 boats. The organizers found a way to accommodate 20 more, and surprise, surprise, almost instantly after that announcement, there will be 90 boats competing. If you read this before then, I strongly urge you to find a ride! These family reunions are the kind you really look forward to. If you are involved with a different class, you could do much worse than to strive to do it like these folks. For more info or tips on fleet building, etc., contact Class Secretary Laura Jeffers at lightningclass.org.